A group of us have decided to enter the Brianhead Epic 100. As a test to see if it would be possible to finish the race we decided to do the White Rim Trail in Canyonlands in a day. The whole loop is over 100 miles but the last dozen or so are a boring road so we skipped that part. We started where Mineral Bottom Road meets the highway (313) and traveled clockwise until we climbed back up the cliff on the other end of Mineral Bottom Road, which is 89.2 miles according to my bike computer. I did this same trip last year with the 14-18 young men from our ward in three days. 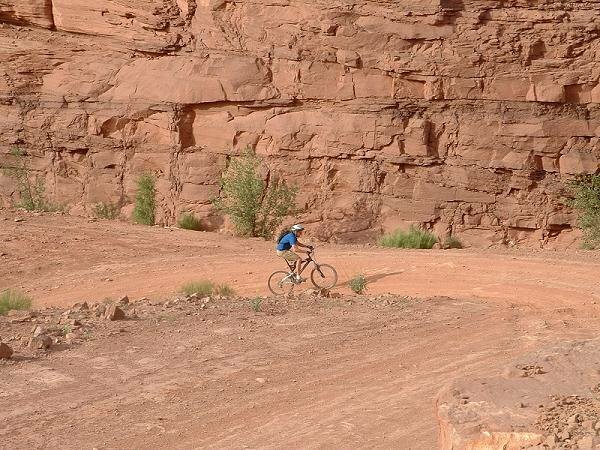 This time as I rode the section from White Crack to Murphy's Hogback I was remembered how much fun the second day was when we rode the same section. Also last year I thought that it would be impossible for anyone to climb the hogback, but I was able to do it this year. Of course they had fixed the road this year. Last year there was a bunch of rocks near the top that the 4x4s were having trouble getting over. This year they had filled in that section to where it was no longer a problem. The weather was beautiful. It didn't seem to get hot until we were leaving Potato Bottom, and even then it wasn't too hot. However, the wind at times was brutal. It just doesn't seem right to have to be working to go down hill! I was pleased with how well the trip went. I only had two spots where I got stopped and had to push for about 10 feet, and I felt better after finishing the ride than I expected. The worst part was that I don't have padded shorts so I was quite sore in the rear when I finished. After having ridden this I am feeling good about the Brianhead Epic, even though I know it will be more difficult.